As I exited the taxi a tall, dark, man wearing flashy sunglasses and brown tunic that nearly reached his ankles, approached me. This was Fawaz, my work exchange host for the next two weeks. While he appeared intimidating at first, maybe because of his height alone, his warm smile and outstretched hand made any first impressions quickly fade away. The head scarf he wore was similar to the “desert scarf” that had recently made its way in style in the western world. I noticed how well it protected the hot sun from his face, and when I felt the heat of the desert rush up at me, I wondered if I would get to wear one too. I laughed inside at how something used for such functional purposes here was made a mere fashion accessory in the west. 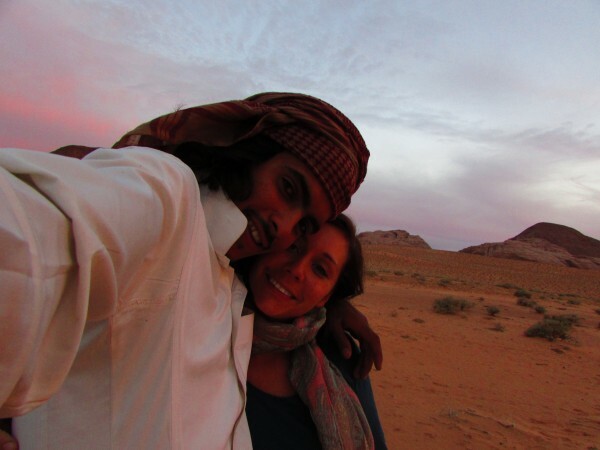 Fawaz brought me to his home, in Wadi Rum village. The village is where many bedouin live, although some spend the majority of their of their time in the wild desert. Most of the village are related in some way, and are all part of the Al-Zalabiah bedouin tribe. The men usually make a living through owning or working for a tour company. Fawaz and his brothers were no different. 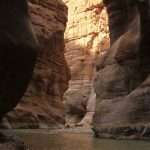 Even his younger brother, age 17, would give tours in the desert, improving his English and showing the ability he learned as a child, of how to survive the Wadi Rum desert. As soon as I arrived, Fawaz’s mother, sisters, cousins and random friends, whom were also called family, greeted me with warmth. While I spoke very little Arabic, I tried my best to convey gratefulness for letting me stay with them for the next two weeks, and an overall general excitement to be there. That afternoon and for the next three days, we spent a lot of our time in the desert. We slept there at night and drove around during the day, visiting friends and family, most who were running tours or camps. Sometimes he would let me help gather firewood for our evening dinner and tea. I was in awe of the desert. 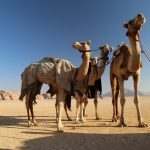 You could drive for hours without seeing a living thing, but would occasionally pass by a heard of sheep or camels, and sometimes even a group of bedouins that still called the desert home. At night you could see probably every star in the sky. Since fire was the light we had when the jeep lights were off, we sat around, drank tea, watching the stars and appreciating the calm, fresh air and silence around us. I had never slept in a cave and was a bit nervous of how I would sleep at first. After getting the best sleep of my life for those three nights, I begged Fawaz to let us sleep out there every night. Fawaz had advertised that he needed help with his website, for his own tour company. Since I had already built my own travel website, I figured I could give his a go. 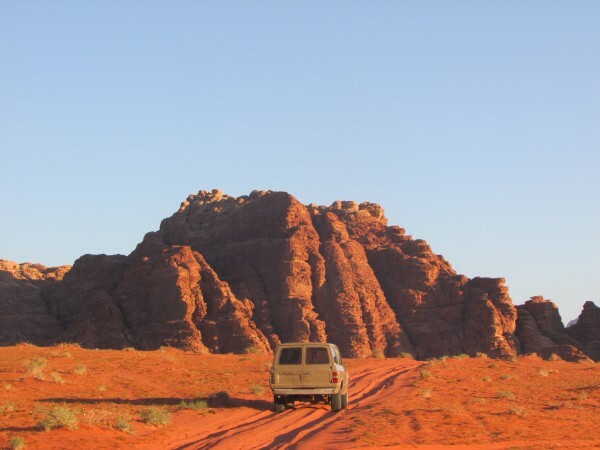 For the days that followed he would tell me exactly what he wanted, and we would test out different website themes and look over what we could add to make it appealing to tourists that wanted to visit Wadi Rum. I loved having a part in the creation of the site, adding in some of my photography from our visits to the desert. While Fawaz took care of my food, shelter and anything else I needed during those days, the work he wanted done was not easy. Sometimes I would spend the day inside working on the site, only to have him want a different look or something that I couldn’t figure out how to do yet. I would take breaks and practice English and Arabic with his younger sisters. Sometimes I would just peak outside, but was discouraged from making myself visible off the property. When I was told that, I realized then and there how differently others looked at me in this society. My clothes were appropriate, but I would be the only woman not wearing a head covering, and my look still gave away my foreign features. When I did go to the store, people were sometimes curious, but mostly friendly. Men would mostly look away if I walked by, as is normal, and a relief from the daring looks I would receive in Amman. Sometimes my limited freedom as a woman didn’t bother me, while other times I would envy the men sitting around drinking tea and chatting with each other, as I didn’t find women doing that all too often. I longed to be part of the group, but I did not belong here. Nor did I feel like I belonged with the women. They didn’t speak English, and as much as I loved studying Arabic, when I would try to speak it, I would get a look of confusion in return. I wasn’t understood. While the women were happy to welcome me to sit with them, often we would sit in silence. Sometimes when I took breaks I would just sit alone in the shade of the brick wall that surrounded the house, hoping someone would come by and have a chat. I felt like when I went into the house I probably stressed out the family since they couldn’t understand me, and they were probably worried that I was so silent around them. The truth is, even with almost 2 years of Arabic study under my belt, I was shy or worried I would say the wrong thing. Sometimes I didn’t even know if as a woman I had a place to talk or interject in a situation. 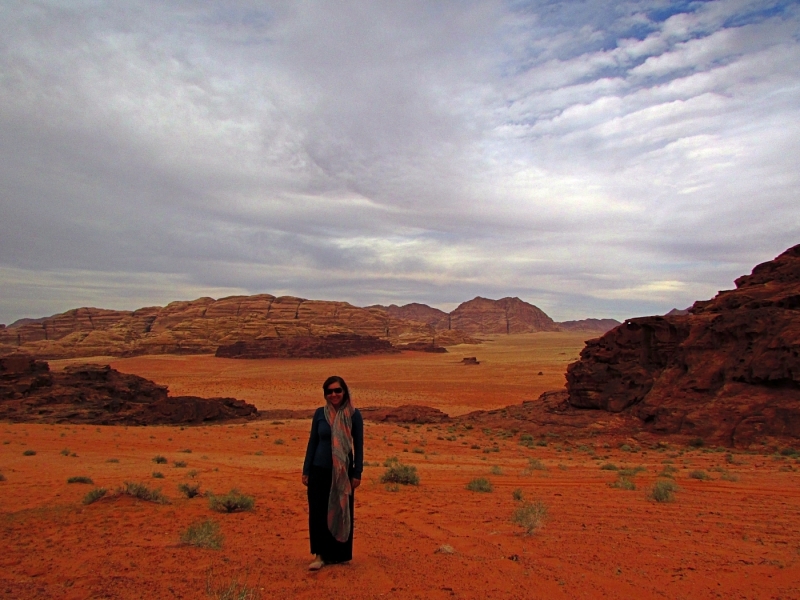 While life in Amman offered women a lot more freedom, I felt like here in Wadi Rum, tradition still reigned and dictated one’s life purpose. Fawaz would see some days that I would spend hours working on the site, and he always rewarded me with a trip to the desert or a special meal to show his appreciation for my work. While he couldn’t offer the excitement and freedom I wanted all the time, he was fair and helped me to better understand the culture and life of the bedouin people. That is after all the reason I had come. We still keep in touch to this day, and from the site he has been able to attract more visitors and business. I thought it was a fair trade for the amazing experience I had living and learning about an ancient, nomadic, culture. While I spent much of my working time at the computer, I would have stayed longer for a chance to stay in the desert, to keep learning and living with such appreciation for the nomadic life, nature and the wilderness of the desert. Hanging out with my host in the desert! Very nice story, Erika. I enjoyed it a lot. Maybe. someday we’ll be able to make a trip to Jordan without worrying about being Americans. Jordan is one of my favorite countries in this part of the world. 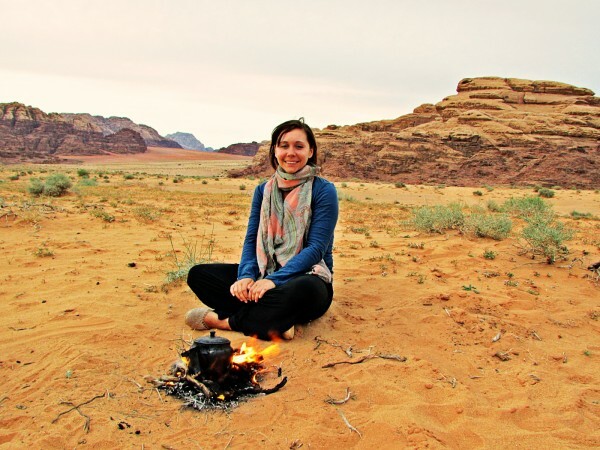 Reading this post and seeing the pictures reminded me of the good times we had in Wadi Rum 🙂 We hitch hiked several places in Jordan – pretty neat experience when some of the people who picked us up invited us in to their home for dinner and to stay the night. I am planning to be back to the Middle East sometime next year.